I just want to take a minute to wrap-up our race to Hawaii. I’m a bit overdue in getting this together, but i got a bit busy bringing the boat back home too! 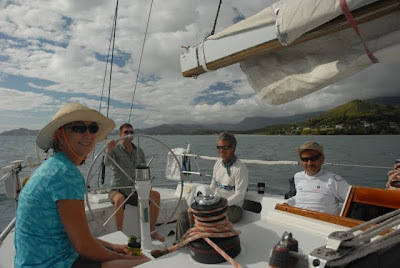 The 2010 Pacific Cup was a fantastic event. Our team of five sailors from around the country and four coaches aboard our new turboed Santa Cruz 50 Hula Girl was a perfect recipe for a memorable race. And what a race we had… with an elapsed time of 8 days and 19 hours, we were the 4th boat to sail into Kaneohe Bay, and corrected out to 3rd in class, and 6th overall (out of 50+ boats!). Not bad for our first outing, eh? Not only did we we end up with a great result, we ended up having a great time. Many thanks to the 2010 Hula Girl Team for making it a memorable event. Out the Gate… next stop, Hawaii! Working hard to give the Hula Girl what she needs… more speed! Now this is more like a Pacific Cup! Hey! There will be none of that ‘napping’ going on… this is a serious race! Look at our pet ‘deck ape’ go! Our trusty navigator, hard at work, takes a bearing with the compass…. whoops, I mean trims his beard with his sunglasses… I think… not really sure what is going on here. The reception in Kaneohe is always great! Ooohhh! Sweet nectar of the gods! 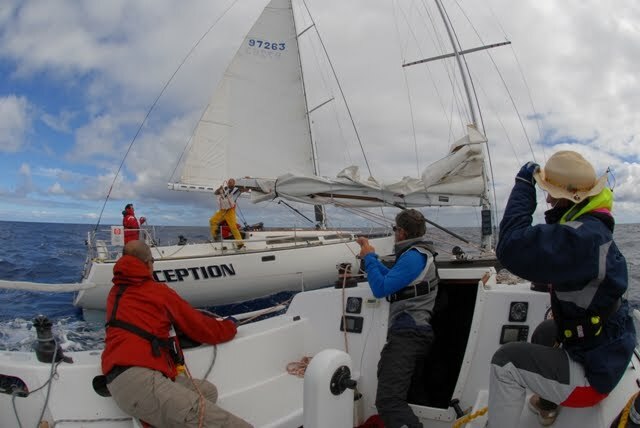 And additional thanks go out to our team suppliers: West Marine for the crew gear, Expedition for the navigation and routing software, Spinlock for the Deckvest Series life jackets and safety harnesses, and McLube for all things slippery. Gracias, amigos! I’m happy to report that Hula Girl is back in SF and getting ready for her season in Mexico… the next race will be the 2011 Newport to Cabo race… any takers? 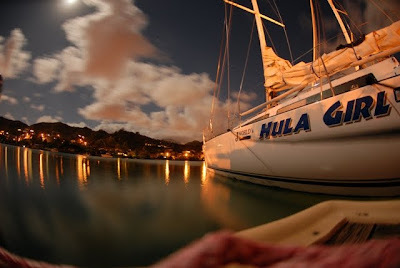 In late July, Hula Girl departed Oahu for California with a crew of offshore cruising students and yours truly as skipper. 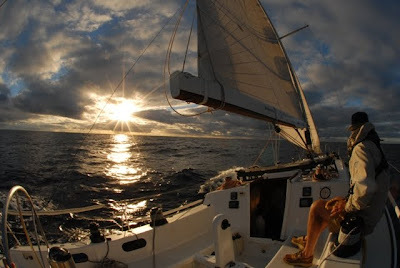 With a strange year for the return weather, we ended up sailing almost all the way… we motored for something like six hours thru the very bottom corner of the Pacific High, but that was about it. We cranked off the miles, and got back to CA in about 13 days. We had a truly fantastic group aboard the boat, and it was an absolute pleasure to get to sail with each and every one of them. 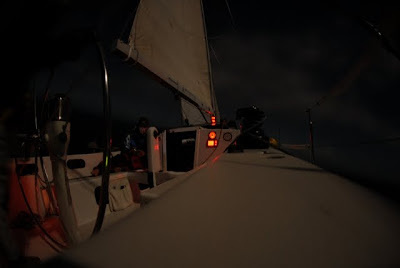 Everyone did a great job, and made it easy on me… they sailed the boat over 2000 miles (I think the autopilot was on for only three hours when motoring!) and should be proud proud of what they accomplished. The good times are too many to mention, but we expect an upcoming cinematic release to document the journey (right Jorge? )… I will take pause to mention this highlight: Jon and Madeline getting married as we sailed in under the Golden Gate bridge after 2000 miles at sea! Very cool…. 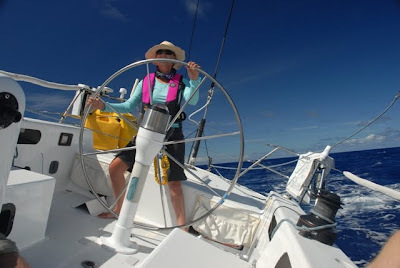 Madeline at the helm… and making a fashion statement! 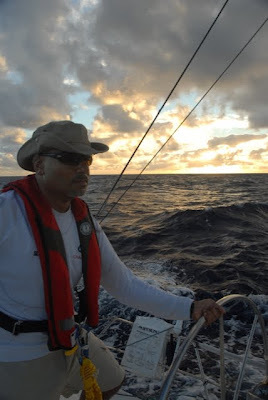 Jorge making it look easy… hey, is that a squall out there?? The Honeymoon Suite. The Ritz it ain’t, but the the view is a solid ten stars. Coming to the aid and transferring a battery to our friends on Deception, 1000 miles from the nearest speck of dry land. Jon and Madeline… the happy couple…. awwwww…. Hula Girl heads for the barn. Hula Girl’s Notebook Computer R.I.P. Barry here… Hula Girl’s Notebook PC took a dive off the navigation table last night, so no more emails to/from the boat. Sorry. 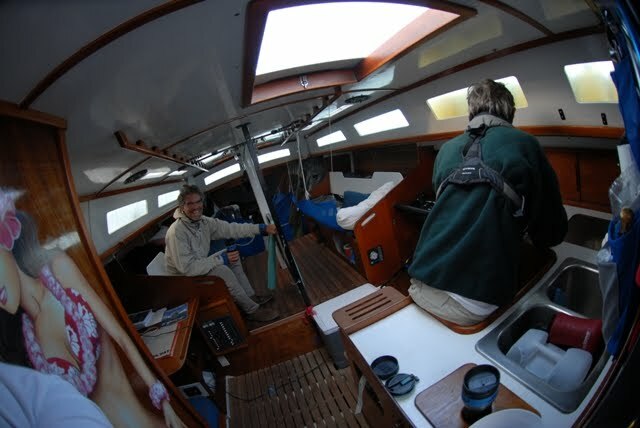 The team will have to navigate to SF the old fashioned way: using one of the two GPS/Chartplotters. LOL! 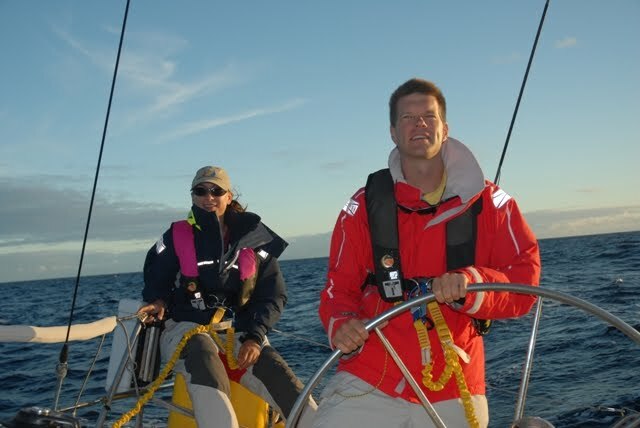 (but they do have charts and a sextant aboard – and numerous handheld GPSs). 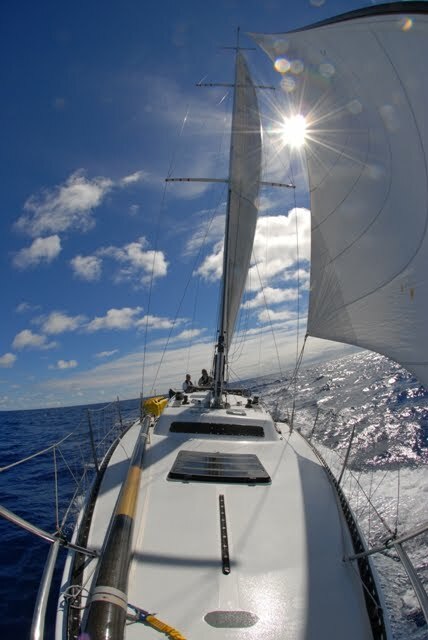 I spoke via sat phone to Wayne and at 14:22 PDT, they were at 38 57N by 131 07W, averaging a course of 82 deg at an avg speed over ground of 9.2 knots. They were 404 miles west of the San Francisco approach buoy, a.k.a. “the Lightship.” They could be at our dock Sunday morning, but I suspect more likely between 2-4 PM. 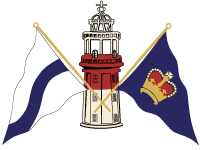 We’ll have a little dockside welcome party for them, logistics permitting! Let me know if you plan on meeting the Hula Girl and her crew at our dock or need additional information to do so. http://sailing-jworld.com/jworldwp/wp-content/uploads/2015/01/Header-Logo.gif 0 0 jworld http://sailing-jworld.com/jworldwp/wp-content/uploads/2015/01/Header-Logo.gif jworld2010-08-06 21:31:002015-01-05 19:48:15Hula Girl's Notebook Computer R.I.P. Well, for a bit there, it looked like we would miss the whole Pacific High on our way to San Francisco from Hawaii. It looked like we were just going to scoot under it without ever getting to the calm waters typical of the center, but last night around 2am the high grew a bit, just enough to include us in it’s personal party. Being night and all when the wind dropped, we fired up the motor and continued on our merry way. Thru the morning watches, we didn’t see much more than about 4 knots of breeze. Very calm waters, and nice clear skies. So there we were, motoring along when suddenly the engine quit. Just like that. Hmmm… not good, I am thinking. My first fear was that we had caught some trash, some scrap of a fishing net, that was drifting here in the high (we all know about all the trash out here… amazing/depressing how much we see in the middle of nowhere). I jumped down below and opened the engine compartment… I was relieved to find that I could spin the prop shaft by hand (meaning that it wasn’t fouled), but then perplexed as to what the problem might be. Well, a quick look at the Racor fuel filter revealed a fair amount of gunk in the fuel. So off came the filter, replaced with a spare and away we go, right? Not so fast… the fuel system isn’t priming… we can’t get the fuel system bled. Finally, after pulling apart the lines to the tank and clearing them, we get the engine running again. And we were off. For 15 minutes. Yep, motor died again. Looked at the Racor again. Filled with junk again. So we have basically had to write off our whole fuel tank as contaminated… too bad, since that’s where about half of our fuel happens to be! But we have about 40 gallons in jerry cans, and we have rigged the engine to run from these, so we are good to go for the time being. And given the weather outlook, far more than we’ll need to get the Hula Girl and her crew back to the barn. 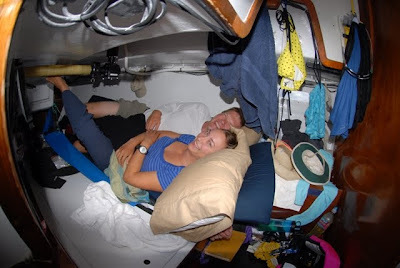 Once we had the engine sorted, we took a bit of time to enjoy where we were. 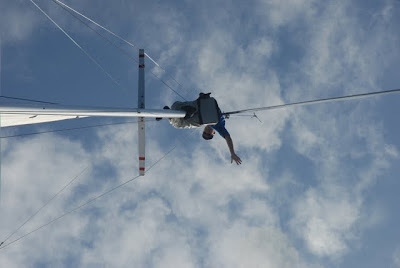 A couple of rides up the mast yielded some very cool pictures. And the swimming was phenomenal. Diving into a pool 16,321 feet deep (well, hat’s what the chart says… we didn;t verify it) of crystal clear water (where you can see something like 5 miles down!) 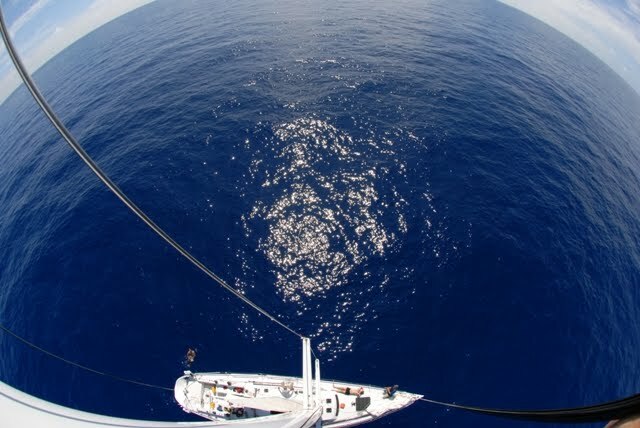 is a bit intimidating when you think about it… especially when you consider that anything 5 miles down can see you too!) So we didn;t think about it and just enjoyed the swim and showers. After our break, we were off again. 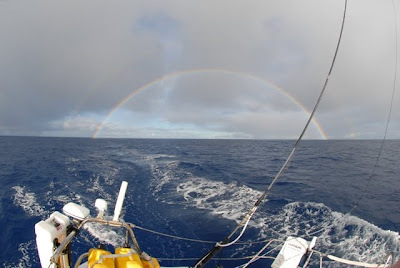 We motored for another couple hours, but then started to stick our nose out the eastern side of the high (as expected), and we were off sailing again! And so starts to final leg of our trip. It’s forecast to be a light reach, then building into a windy reach. 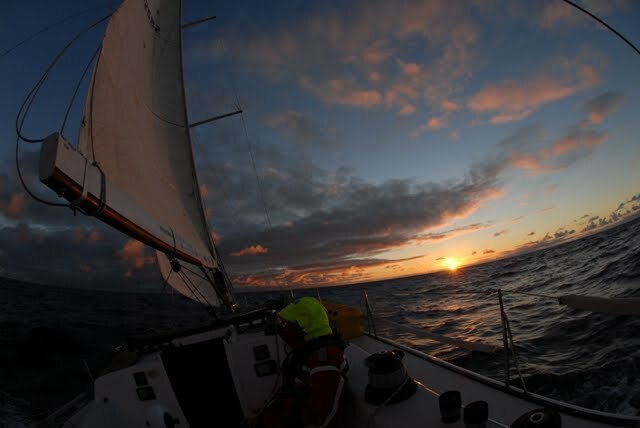 Then maybe getting light again as we near the coast. But we’ll see. As we learned (again) toady, nothing is for certain. A hearty dinner (build-your-own-burrito-bar) was had by all. 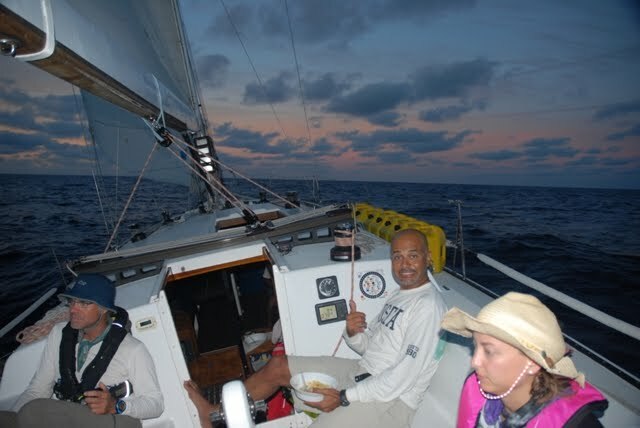 Jorge and Madeline are on watch right now, and the rest of the crew are getting a bit of rack time and preparing for the cooler night watches up in this part of the ocean. Good times. And a beautiful day. The little issues were good challenges to overcome, and great learning experiences. Now may turn to hit the rack. You all have a great evening, and we’ll check in again soon. Contrary to what everyone says…. Contrary to what everyone says… we really are nice guys. A couple of days ago we got word that another Santa Cruz 50 heading home from Hawaii had a problem with their batteries and weren’t able to start their engine… which meant no more power aboard. They had backup navigation systems and communication (a charged Sat phone and handheld VHF’s) and were rolling along fine (even landing some good fish, I hear), so it wasn’t an emergency by any stretch, but with a week still to go, it’s nice to have power. There is an informal radio net on the way back to CA, and a number of boats (Green Buffalo, Jamani, Rhum Boggie, among others) were pretty close and offered help, but we were a bit closer and sailing on the same line (they left a day before us), so all they had to do was slow down and wait for us. Well, 15 minutes later they were all powered up and on their way. 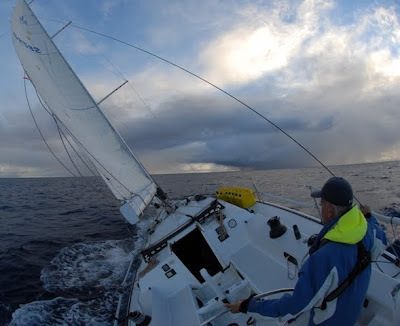 We are almost halfway home at this point, and getting pretty close to the Pacific High, but still carrying great breeze (more now than we had in the Trades!). Looks like we’ll just graze the bottom of the high (instead of the typical route up and over or thru it), and have pretty good winds all the way in. In fact, there are a lot of boats out here with a lot of extra fuel this year. Such a surplus, in fact, that the good natured bidding started on the radio net at $1 per gallon, and seemed destined to fall from there! 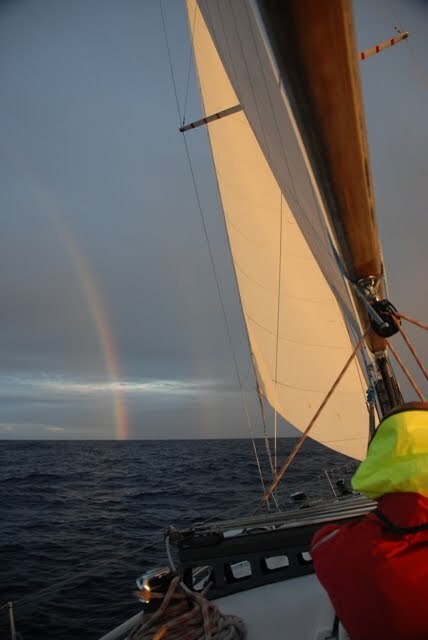 As early as tomorrow afternoon we’ll actually tack over to port tack (after about 1100 miles on starboard!) and point our bow at the Golden Gate. We’ll keep you all posted on progress!